Sunday, November 5th, is the end of daylight saving time! Remember to turn your clocks BACK an hour. This is also a good time to test smoke and carbon monoxide alarms. State Fire Marshal Jim Walker says that smoke alarm technology has advanced and many now come with 10-year batteries and some are tamper-resistant. 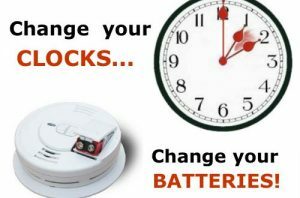 He encourages residents to test their alarms before changing the battery, and to be sure to replace any smoke alarm that is 10 years old or older. * Use the smoke alarm's hush feature to silence nuisance alarms. * Practice you home fire escape plan at least two times a year at different times of the day/night.